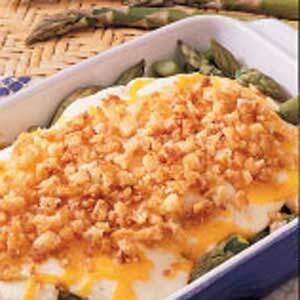 Saute asparagus and onions in one tablespoon butter until crisp-tender, about 8 minutes; transfer to a 1 1/2 qt. casserole dish. Set aside. Melt 2 T. butter in a saucepan; whisk in flour until smooth. Gradually add milk; heat and stir until thickened, about 2 minutes. Reduce heat; mix in cream cheese, salt and pepper; stirring until cheese melts. Pour over asparagus and onions; sprinkle with cheddar cheese. Melt remaining butter in a small skillet. Remove from heat. Add bread crumbs. Toss gently. Sprinkle over casseole; bake at 350° for 35-40 minutes. Serves 4 to 6. Yum! This is a rich and creamy side dish. Great served with Grilled Salmon or Chicken and a salad.